Posted by Tantumblogo in abdication of duty, asshatery, Basics, disaster, error, foolishness, paganism, rank stupidity, Revolution, scandals, secularism, Society, technology. 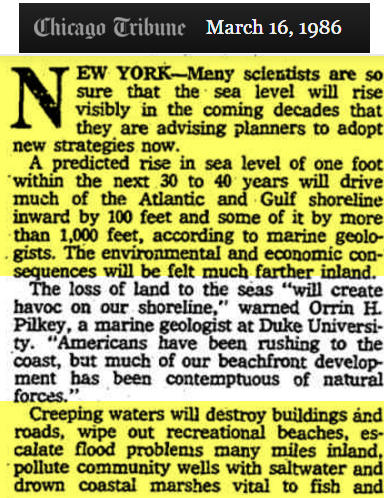 In 1986, scientists were “sure” that sea level would rise one foot on the East Coast in 30-40 years, and destroy beaches and buildings, receding shorelines by 1,000 feet. So how did they do? There has been less than three inches of apparent sea level rise, most of which is due to land subsidence rather than actual sea level rise. I’m very hard on scientific claims of this kind for two primary reasons: one, they represent what amounts to the prophetic arm of the religion of sexular paganism, constantly forecasting divine vengeance from an afflicted Gaia for our terrible sins against……..leftism. Yes, leftism, because all the prognostications of doom are really oriented towards one thing, not saving the planet, not stopping global warming, but towards crushing all opposition to the leftist-sexular-pagan agenda. My other prime reason for vilifying these kinds of false claims is due to their role in undermining public respect and acceptance for real science, science not at the service of a political-religious agenda. Unfortunately, a great deal of “science” has been deliberately oriented towards a political-cultural agenda going back two hundred years or more. It is reported by Diane Mozcar and others (Warren Carroll) that Darwin was not the perfectly unbiased naif casting about for pure truth he is portrayed as being in the supportive (left-leaning) media and histories. He had a long familial history of being adherents to more radical elements of enlightenment thinking and reducing God to a deist interpretation – sort of a cosmic starter gun who set things in motion and then had no involvement whatsoever. Darwin himself admitted, some time after publishing On the Origin of Species, that his theory definitely had anti-Christian connotations, and that those connotations were not accidental. He set out looking not simply for data, but to confirm a highly dubious hypothesis. Only the data that supported the hypothesis was accepted, for the most part. After publishing Origin, Darwin then went on a literal world tour giving speeches and writing books attacking traditional Christian piety. His basis for deciding that God didn’t direct the development of life on earth was his high Victorian sensibility that “God wouldn’t do things such and such a way” when he saw what he perceived as “waste” or “uselessness” in various attributes of creatures. Thus his biases colored his conclusions at least as much as his research. Many of Darwin’s more specific claims have had to be set aside by subsequent evolutionary science as untenable. Once again, agendized science as a vehicle of social revolution gets to cover up its false claims and disproven theories, while continuing to insist upon basically an assent of faith from its adherents to whatever it is claiming this week. We have to bear in mind how much of the sexular pagan agenda has been advanced by ostensible scientific claims. Scientific hysteria regarding overpopulation helped contribute to the legalization of both contraception and abortion. People are very likely much fatter and sicker (intentionally so?) due to false claims of scienticians regarding proper diet, stressing high carbs and low fat. There are a plethora of other examples. Mind, I’m an actual design engineer. I have been so for over 20 years. I’m not an English major turned science cultist, hanging pictures of Neil de Grasse Tyson on the walls of my house to appear all sciencey. I say that because such a cult has become very prevalent among the left in recent years. Contrary to the cultists, I have performed computational fluid dynamics for twenty years, and I know the incredible limitations inherent in this analytical technology. Even in a simple closed system with a tiny fraction of the variables encompassing something so complex as the world, if you can get data accurate to within 5% of reality you’re doing very well. With the climatologists forecasting temperature changes on the order of 2-3 degrees per century, I would be astonished not to find that their results are well within the margin of error of the analytical models. One of the principle complaints regarding these CFD models upon which all the global warming hysteria hangs has been the refusal of many of the most extreme proponents of doom to share vital details of their models with others for independent review. And then we have the scandal of the manipulation of ground-based temperature sensors, always forcing the alleged “temperature record” up. So, yes, I take a very dim view of much of “science” at this time. I feel very strongly science has been irrevocably compromised by the introduction of massive government funding starting in the 50s. Whatever government touches inevitably becomes politicized. I feel it no accident that since this politicization has begun, we have seen more and more headline-seeking, outrageous claims from science, which are often later contradicted. This is really a huge problem, for a technologically-based society. But that’s enough of that for today. Don’t be so cocky, buddy. There’s still 50 days to go. You’ll see, you’ll see. Wait for it, wait for it…. Do I sound like a jehovah witness?! I assumed they’d visited your neighborhood recently. By any chance did you have that UT Prof with the German accent for mechanics of fluid flow? His favorite expression when you got a question wrong : “you will be punished!” Can’t remember his name…. No, but I wish I had. I had Dr. Bogard, as bland a professor as one can imagine. I did like Dr. Ken Ball for heat transfer, and Dr. Matt Hall for thermodynamics. He was OK. He may have retired by your time, what a character. Don’t recognize those names, but I was pet. eng. My thermo prof., A.D. Hill, was the worst. We had an old dude name CP Lamb – Dr. Lamb – who was kind of a good ol’ boy nut. He was formerly head of the ME department but mostly retired by the time I got there. And then there was Professor Torkelson, I have no idea what he taught, or if he taught, but he dressed like a Scotsman, kilt and all, and drank his pints every day at lunch at Crown and Anchor (still my favorite place in Austin). Don’t know any PE profs, I never even went in the building, even though it was next door. Ever go back to campus? I agree, and same goes for the AmChurch, in particular Catholic Charities. I never give to them anymore.